Michael Foster, the ‘CEF Professor’ from Contrarian Outlook, joins us for another episode to explain how to use municipal bonds to scale your tax-free income. 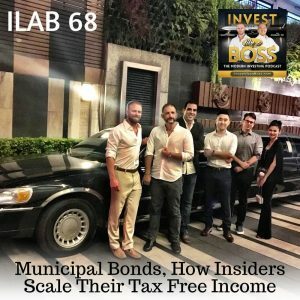 During this episode, you’ll find out how to buy municipal bonds, determine if you should buy an individual muni bond, and understand the risk levels of the entire process. You’ll learn how a municipal CEF operates, what tools to use, and how interest rates impact closed end funds. Listen to the end to hear Michael’s top three muni funds and what Sam and Johnny Invest into themselves. Listen to ILAB 68 on iTunes here or subscribe on your favorite podcast app. 06:09 – Are muni bonds boring? 07:27 – Why others invest in muni bonds? 10:40 – Should you buy an individual muni bond? 13:00 – How does a municipal CEF operate? 26:59 – What is the risk level? 34:46 – Should you worry about fees?